Trademarked as a band possessing sound of Seattle or Grunge, Alice in Chains has proved their music diversity and artistic caliber over the years of their remarkable music career. 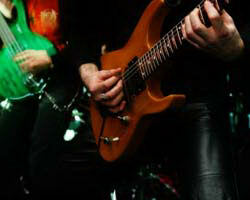 The band is best known for mixing individualistic and rebellious heavy metal sound with finely produced acoustic riffs. Alice in Chains is highly recognized among other popular Seattle-based bands like Nirvana, Soundgarden and Pearl Jam. The band is active in the rock and heavy metal scene for more than 25 years now and during this course it has produced several EPs, Live and compilation albums along with five full fledge studio releases. Their music has been greatly associated with the ‘grunge movement’ which began to spur during mid and late 1980s. With their newest studio release ‘The Devil Put Dinosaurs Here’ in May 2013, Alice in Chains embarks on their latest tour to different cities around the world. The legendary band would be making a stop at your hometown and you can now get Alice in Chains tickets to enjoy their enchanting live performances. Founded in 1987, the band primarily was a one man show named Jerry Cantrell. The profound vision of Cantrell bonded other members together throughout their music journey. The best thing that happened to the band was the Cantrell and Layne Staley team-up. This dynamic duo laid the foundation of the band as Alice N’ Chains which gradually emerged as Alice in Chains. To strengthen the base, came along two other talented musicians Mike Starr and Sean Kinney who completed the band by adding drums and bass. This four-man show initially presented their talent at gigs and local concerts until they were spotted by the native promoter Randy Hauser. Hauser agreed to pay for their demo recordings but somehow the recording kept on delaying due to the social upheaval going on in the State. The final recording of their demo completed during 1988 and was founded by the managers Susan Silver and Kelly Curtis, who imparted the demo to Columbia Records. Due to their impressive style and unique musicianship, the band was signed to the Columbia Records in 1989. This was indeed a major milestone in the band’s music career and soon the recording for their first album began. ‘Facelift’ was launched in 1990 which debuted at number 42 on Billboard 200. The album was a mild success until its single ‘Man in the Box’ ran on MTV’s regular rotation and soon charted at number 18 on Mainstream Rock. The album got the Gold certification by RIAA, selling 400,000 records in the US alone. The band went on to perform at different venues countrywide and meanwhile worked for their EP in the studio recording sessions. The result was the release of the EP ‘Sap’ in 1992 which also featured the voice of Ann Wilson in one of the songs. This different kind of EP became successful and was again certified as Gold. Working passionately with lifted morals by the initial successes, Alice in Chains launched their critically acknowledged second studio album ‘Dirt’ in September 1992. The album had a lot of personal relevance to the songs and hence it broke all the previous records of the band’s success, becoming quadruple Platinum and the highest seller by the band to date. The album also generated five top thirty hits and hanged on the charts for almost two years. Following this monumental success; came another addition to the band’s prestige and glory in the form of ‘Jar of Flies’ in 1994. This second EP became the first ever EP to top the charts and hence band’s first launch to peak Billboard 200. The band kept on performing and touring various locations in the following years and released it self-titled third album in 1995. This release topped the charts and gained the band widespread fame, until the band lost its focus after 1995 due to drug addiction of the band’s front-man Layne Staley. Staley died in 2002 and William DuVall joined the band as lead vocalist during the band’s reunion shows in 2005. This new line-up worked well and the band released their fourth album ‘Black Gives Way to Blue’ in 2009. Touring worldwide, the band performed in various events and music festivals. Another tragedy hit the band when the founding member Jerry Cantrell died in 2011. Though devastated by this unfortunate event, the band gathered itself again and launched their latest studio album ‘The Devil Put Dinosaurs Here’ in 2013. This latest release marks the magnificent comeback of the band in the form of their recent tour. The bold blend of the mutinous heavy metal tunes and gentle acoustics is what makes the band unique. Throughout their music journey the band has sold more than 25 million records throughout the world, achieving various awards and accolades including eight Grammy nominations. This legendary band is ready for their latest round to your hometown. You can buy Alice in Chains tickets to experience their energetic live shows with your beloveds. Get your hands on them before they are sold out.